Den. hymenanthum, Note: Mini-species , Mounted. 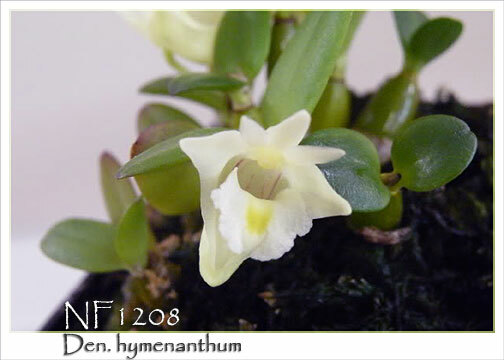 A rare and fragrant miniature Dendrobium species that’s easily tucked into any collection ! Most often found in Thailand and the Philippines, this warm grower produces its flowers on short successively flowered spikes arising near the apex of the cane and between the leaves in spring and early summer. Reduce watering for 3-4 months in the winter, then resume normal watering with the start of new growths in the spring. When well grown, this little plant can be literally covered with its small white flowers. A great new mini ! . hymenanthum, Note: Mini-species , Mounted.